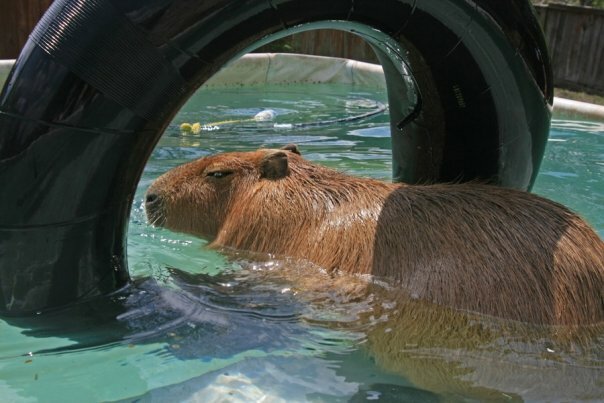 I dread holidays. All of them. Well, not the religious ones because my owner doesn’t celebrate those, but all of the non-denominational holidays that should just be fun, those are the ones I hate. This week we celebrated St. Patrick’s Day, an observation of all things Irish. What’s that got to do with me, you might wonder. 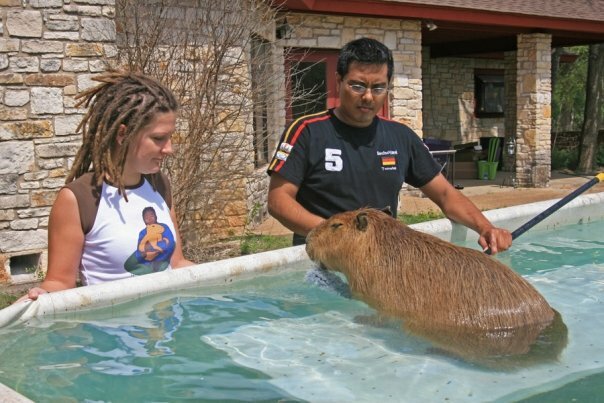 Obviously, capybaras are not Irish; we are from South America. My owner isn’t Irish either, she’s half Greek by way of Panama and the other half is some German-English mix. 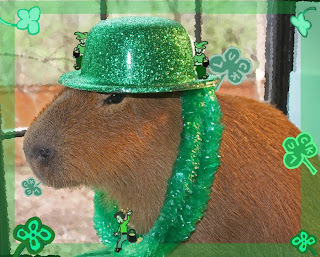 But the actual Irish, and those of Irish descent, make this ridiculous claim that everyone is Irish on St. Patrick’s Day, and according to my owner, that everyone extends to me. 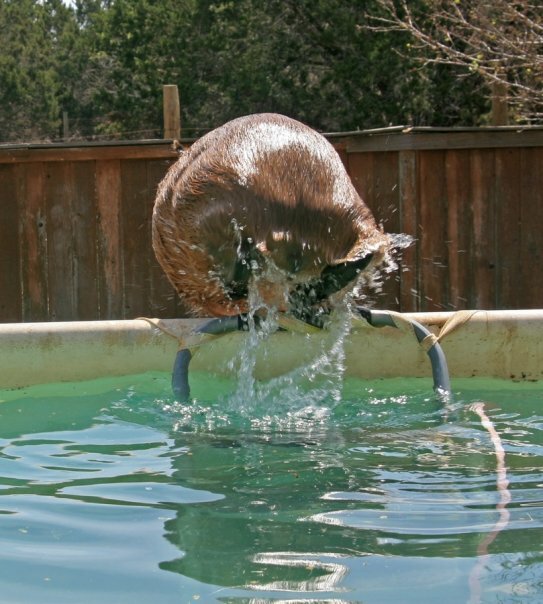 Look at the photo of me at the top of this blog. Do you see that? 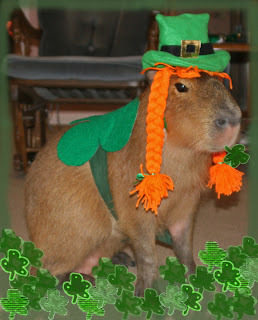 I’m dressed up like a leprechaun with orange hair, a big green hat and a shamrock on my back. That was last year. Below you can see what indignation I had to suffer this year. Tiny green men sitting on me. They weren’t really there but still, the photo is humiliating. This fiasco started when I was a baby ‘bara. 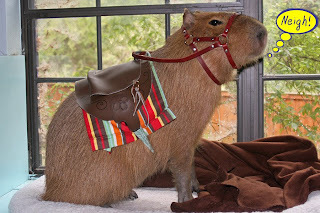 I remember the first time my owner dressed me up. I wasn’t three months old. When Halloween came around she took me to the pet store and tried a variety of dog costumes on me–dog costumes!–finally settling on Pocahontas even though she suspected I was a boy. Halloween 2008 she dressed me up as one of the horses. At New Year’s 2008 and 2009 she made me look like a drunken lush. 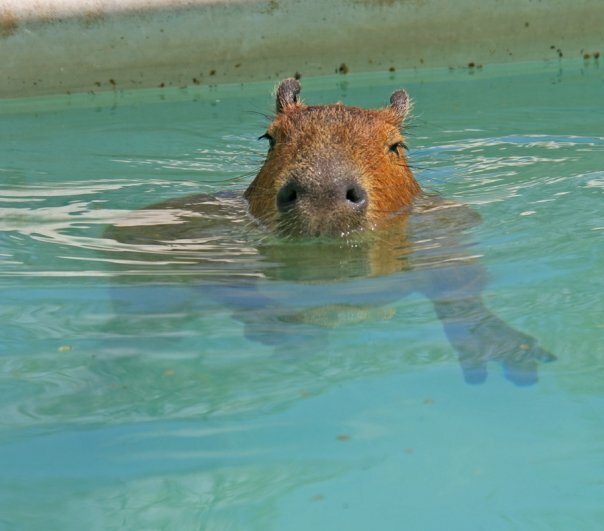 Do I look like the kind of capybara who would drink to excess? I guess this has a good message but why make it look like I would do that? 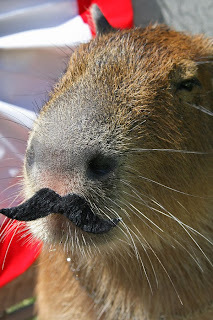 For Cinco de Mayo I wore a mustache. 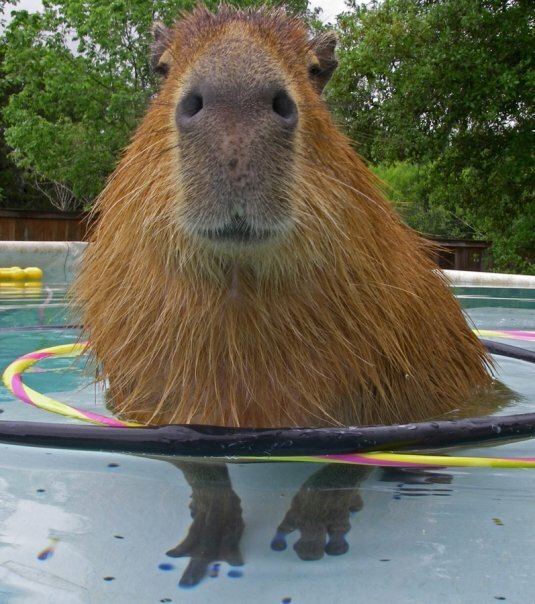 I don’t think capybaras can even grow a mustache. And for July fourth a tiara. 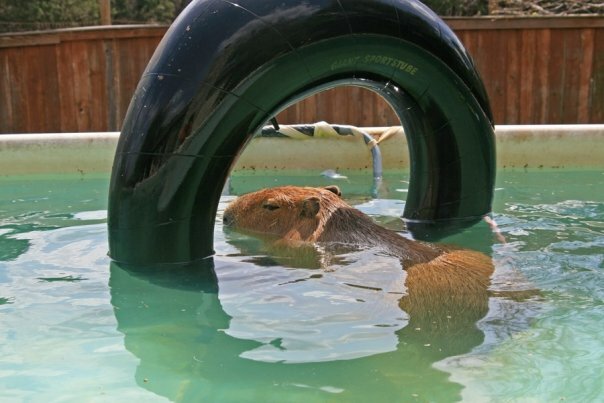 We capybaras are dignified animals. We don’t need this kind of decoration to make us beautiful or interesting or to get attention. I can tell you, I get plenty of attention as it is. Why does she do this to me? 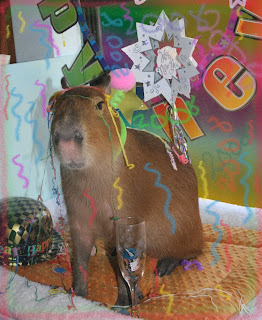 Looking on the bright side, I only have to wear the stupid costumes for a few minutes and it’s not a holiday every day. So I’m not as bad off as some of those dogs with their cute little sweaters and booties. I think I’d have to bite her if she tried that. “Go Obama”? Wow. 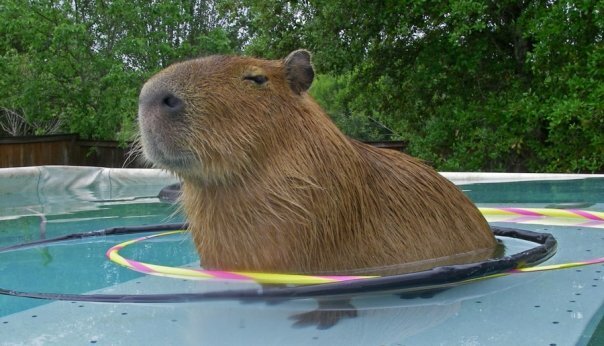 On that note I’m canceling my “follow” because you’d have to be about a smart as a Capybara to have voted for that guy. Thanks, socialists. Seems your favorite kool-aid flavor is cherry red. On another, more cheerful, note: Caplin, your rugged good looks make any outfit shine. And you look fabulous (albeit a mite hairy, but that’s tres Parisian) in drag. 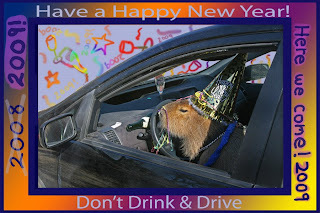 I hope your owner took away your keys on New Years, though. 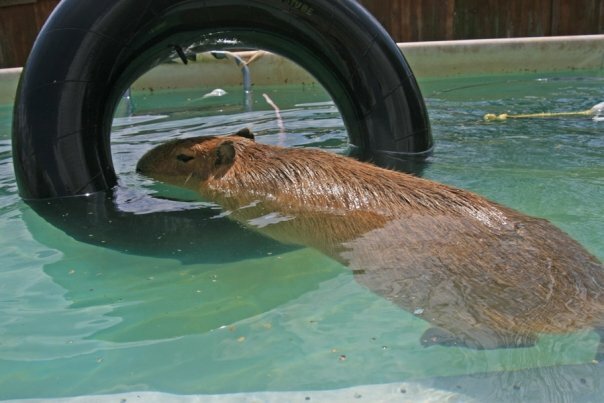 If I had a dime for every capybara hauled in on DUI/DWI charges… well. I’d be living the life of Riley, whoever he was. Oh Caplin, you look adorable all dressed up. 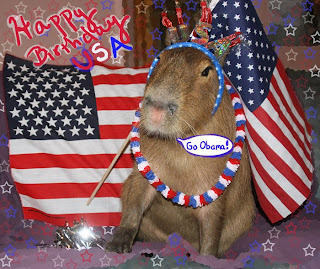 I especially like the little horse costume. 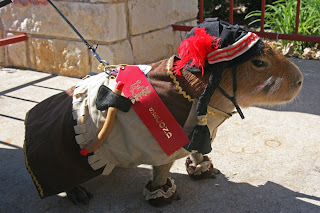 I enjoy dressing up, because I get lots of treats for modeling. Good grief, I think Red is going to drink the kool-aid. Caplin, your costumes are very cool. I asked the lady to get me a leather jacket but all she got me was this silly Harley-Davidson collar.